After 16 days of adrenalin and delight, of contests fought and won, of teary triumphs and devastating defeat, the Games of London 2012 are abruptly at a close. Ten thousand athletes have headed home, the crowds dispersed, the cauldron extinguished. In their place, along with the unforgettable memories, is a sadness too that something so fun is now consigned to the past. 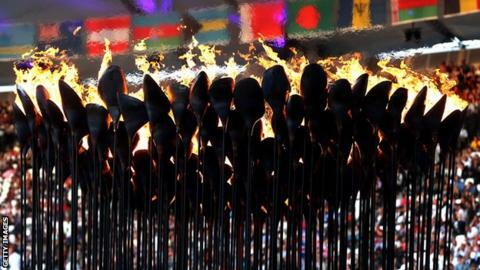 Danny Boyle's opening ceremony spoke of "Isles of Wonder". In the days that followed his spectacular, the stars of 26 sports and 302 events made that promise real. Established icons like Usain Bolt and Michael Phelps dominated the headline sports. Olympian greats like Chinese diver Wu Minxia and Italian fencer Valentina Vezzali lit up the undercard. Great names known previously only to aficionados stepped into the limelight to dominate and amaze - 800m machine David Rudisha, Dutch cycling queen Marianne Vos, Yorkshire's triathlon titan Alistair Brownlee. Young talents destined to dominate broke through and stood tall: Ruta Meilutyte, seizing 100m breaststroke gold at 15; Gabby Douglas, aged 16, winning both individual and team all-around gymnastics gold; Kirani James, the future of 400m running, adding Olympic gold to his world title aged just 19. For the host nation, there was success beyond belief - 29 golds, 65 medals in total, won from Weymouth to Waltham Abbey and drawn from 19 disparate sports. It's good to share: Mo Farah borrows Usain Bolt's "archer" while the sprinter tries out the "Mobot"
The slogan "Our Greatest Team" had seemed before the Games to be dangerously close to hubris, a promise that might not be kept and an inadvertent insult to the champions who had come before. Now, with the class of 2012 finishing an unprecedented third in the medal table, it is instead the most straightforward and accurate of descriptions. Britons won medals standing and sitting, punching and kicking, swimming, biking and running and sometimes all three in succession. There was 'Super Saturday', that giddy day of six golds, more than had been won in 15 entire Olympics of the past, and in the main stadium, three in 46 minutes alone on the greatest night of athletics in British sporting history. Three or more golds were won by British athletes on six different days, two on each of four other days. Andy Murray triumphed at Wimbledon. Dave Brailsford's track cyclists thumbed their noses at UCI rule changes and ruled the velodrome regardless. Out at Eton Dorney, the rowers grabbed the regatta by the throat and never let go. Opponents muttered about magic wheels. The nation just kept celebrating. Medals were won across class divides and ethnic groups. As new national heroes like Laura Trott and Nicola Adams emerged, sports few had cared about obsessed us all. Double trap shooting, double canoe slalom, double delight in a single afternoon. At one point last week, Britain won gold medals in dressage and women's boxing within the same hour. World, you found yourself singing - can we play you every week? Which sports surpassed expectations and which did not deliver at London 2012? During the opening ceremony, Sir Tim Berners-Lee, the inventor of the World Wide Web had emailed a message on to grandstands all around: 'This is for everyone'. As millions around Britain cheered their compatriots on and celebrated together as they came good, it felt increasingly like a two-week feel-good mantra. Two and a half million people came to the Olympic Park; seven million saw some part of the Games in the flesh. Those denied access by bad luck or a creaking ticketing system watched on giant screens and small smartphones alike. There were 70,000 volunteers who gave their time and cheery demeanour for free. Smiling members of the Armed Forces made bag-searches and security checks an easy pleasure. Britons do not have a monopoly on sporting support, but they will cheer anyone and watch anything - 80,000 watched a single match of women's football. Thousands lined the streets and parks for events as unglamorous and unusual as 50km race-walking and 10,000m of open-water swimming. In the ExCeL the noise actually hurt your ears. In the velodrome and at the athletics, it threatened to stop your heart. There were tears where you expected them and tears where you did not. Sir Chris Hoy cracked as his sixth Olympic gold was placed around his neck; swimmer Chad le Clos's dad Bert, celebrating his son's shock victory over Phelps in the 200m butterfly, became a viral sensation with his paternal eulogy. For some, like South Korean fencer Shin A Lam, it was the pain of defeat that turned on the taps. For others, like 400m hurdles gold medallist Felix Sanchez, it was the memory of family members who were no longer here to witness their moment of triumph. There were unexpected supermen - American Manteo Mitchell running the last 200m of his 400m relay with a broken leg - and unprecedented superwomen like Sarah Attar, last in her 800m heat by more than half a minute but the first female from Saudi Arabia ever to compete at an Olympics. There were also curios. A man with a hip replacement won a gold medal for Britain; when we had finished praising Nick Skelton, we looked up to see a German horse called Damon Hill moonwalking in front of the Old Royal Naval College. Some celebrated with fast food and long-denied guilty pleasures. German discus champion Robert Harting went partying on a cruise liner, lost his clothes and accreditation and spent the night of his greatest triumph sleeping rough at Stratford Tube station. Was a generation truly inspired, as Lord Seb Coe promised and so many hoped? It will take more than this month to know. As one wag said, these Olympics dragged millions of kids away from their computer games and motivated them instead to watch endless hours of sport on TV. For now, with the memories still fresh, we are left with a series of vivid snapshots: Sir Wiggo on a gilded throne, seas of union jacks, Gamesmakers with giant foam fingers, and gold pillarboxes popping up around everyone's corner. We saw dancing NHS nurses, BMX racers framed against a blue east London sky, a blighted corner of the capital awash with wildflowers, Usain doing the Mobot and Mo doing Usain's archer. Now it's all over, there is just one more impossible thing to ask for: can we do this every summer? Read more on Which sports won and lost at London 2012? What do the media make of London 2012? Read more on What do the media make of London 2012?